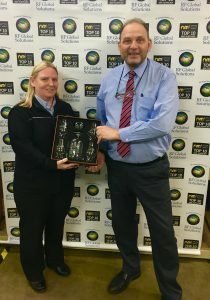 Claire McCulloch has been a valued employee of RF Global Solutions for the last 10 years. She is a highly experienced member of our East Kilbride based finance team. It is with great pride that we are able to present our award to Claire. The award reflects our appreciation for Claire’s dedicated years of service and is a symbol of her personal and professional achievements within the organisation.People are and always will be our greatest asset.